Each year in March schools and communities across the country celebrate Youth Art Month. A month of promoting art and art education. Thousands of American schools participate along with communities and local art organizations. 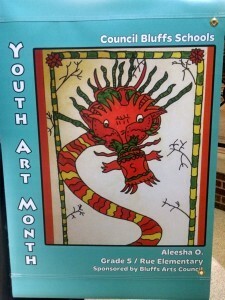 A friend told us that many of our TeacherLists schools in the Council Bluffs Community School District in Iowa are participating in a super cool Youth Art Month project. 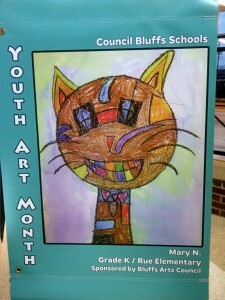 Select students from every school in the Council Bluffs District will have their art showcased on a light pole banner along the historic main street in the town. We’re glad that these teachers and students were armed with the best art supplies for their year because look what they’ve done with them! What a beautiful stroll through town it will be when each pole is adorned with a banner of artwork from a young students. And what a great way to celebrate art while recognizing the youngest members of the community! We know that this is just one example of how towns and school celebrate Youth Art Month. So check out the Council Bluffs celebration, then tell us more: what do you do in your school or town to celebrate art and young artists?